No coating, No plating. Made of 304 grade 18/10 stainless steel, much more stronger and higher resistance to rust than most of the cooling racks in the market. A single rack size: 14.5" length, 10.5" width, 3.5" height. 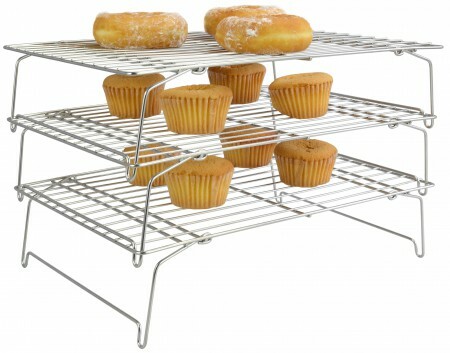 Stackable 3 racks set. Easy release and clean-up. Dishwasher safe. Most of the cooling racks in the market are made with cheap iron, the Surpahs 3-Tier Stackable Cooling Rack made by pure 304 grade stainless steel, it has no coating, no plating, much more sturdier than those cheap iron made cooling racks. Oven and dishwasher safe.